RIGOL Announces New DS2000E Series Oscilloscopes. Beaverton, OR – September 12, 2017 – RIGOL Technologies introduces its new DS2000E Series Oscilloscope, a 200MHz, 2 channel scope that continues RIGOL‘s tradition of combining unmatched capabilities at unprecedented price points to transform the test and measurement industry. The DS2000E is available at either 100MHz or 200MHz bandwidths. All models provide 2 analog channels with 50 Ω input impedance standard. With real-time sample rate of 1GS/Sec (on both channels), memory depth of up to 28Mpts standard, and waveform capture rate up to 50,000 wfms/sec, the DS2000E provides the raw instrument performance required to meet today’s more advanced debug challenges. 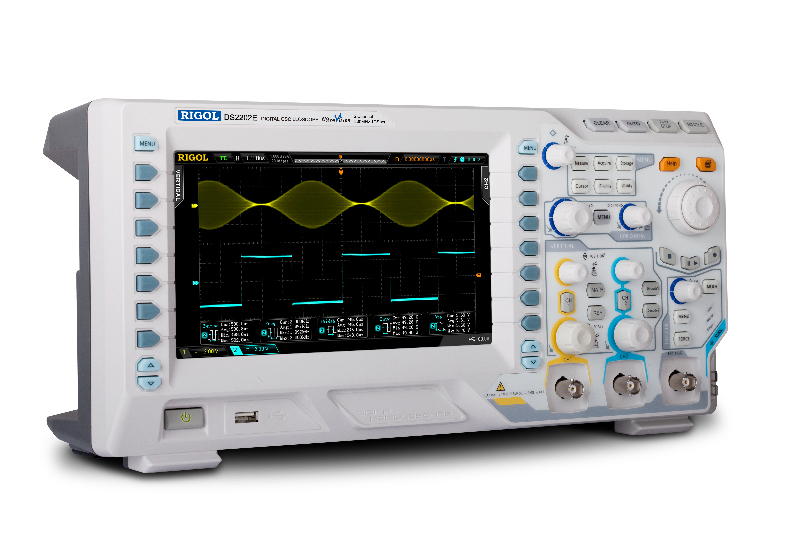 When coupled with the large 8 inch WVGA intensity graded display, complete network connectivity, hardware waveform record/playback, serial trigger and decode, and other advanced analysis capabilities, starting at just $647, engineers and technicians will see RIGOL has again transformed the price performance assumptions in the Basic Oscilloscope Market. From now until 3/31/2018 RIGOL will provide a free options upgrade with the purchase of any new DS2000E. This bundle includes all Serial Decode (RS232, I2C, SPI, CAN) and Advanced Triggering options. This $257 value further extends the transformative price/performance capabilities of the DS2000E and makes it the obvious choice for designers and technicians needing advanced embedded debug capabilities with limited budgets.